This is a picture of a newly built UD Nissan Diesel heavy wrecking truck as used by the Tokyo Fire dept it is still to be painted red the front has a crane for lifting cars etc and on the rear is a cradle similar to a heavy tow truck. The truck is a new model reciently released and is about 450 hp. 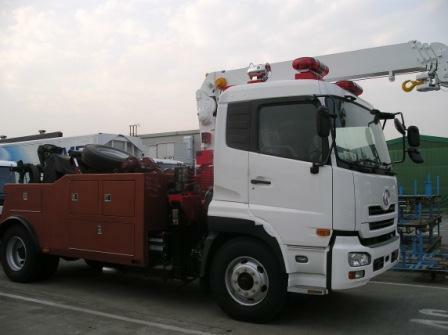 This appliance is used by Tokyo Fire Department (TFD) in lifting debris and towing written off fire appliances.Beside this appliance TFD also own several engineering vehicle like the mini-bulldozer, mini-excavator, mini-wheeloader and equipment carrier.These engineering vehicles are used when earthquake occurs.